Forging(Hada): Forging is conspicuous Itame-hada and Mokume with some indication of entwined flowing mark. The entire Hiraji surface is covered in speckled Ji-nie that generates reflecting irregular whitish Utsuri effect over the surface. Temper(Hamon): Hamon is a bit on stronger side Nie hard metal granules base, shallow undulating NOTARE mixing in combined Gunome like a crab-claw and tassel-shaped Choji and Togari-ha quench pattern where works with rather on stronger side of sparkling Nie and deep Noi mist-like crystalline area. Some temper shows splash Tobiyaki over the surface and clear indication of YUBASHIRI-isolated patches of Ji-Nie indication. In the interior of temper, there works with isolated dots of YOU, generous activities of Nie such as frequent Sunagashi short line of Nie and some indication of threadlike area of Kinsen. Tang(Nakago): Nakago is in UBU original. Two peg retaining holes. Shallow Katte-sagari (slightly slanting left) filemarks. Back ridge of Nakago is flat. The Nakago is relatively short for it's long cutting edge, double bevelled heel shape Kurijiri. The inscription signature is located upper the Shinogi-ji in front FUYUHIRO-saku 冬廣作. FUYUHIRO 冬廣, said a son of 3rd generation Sōshu-HIROTSUGU 相州廣次 who lived in Sōshu province, went to live in Obama, Wakasa (now Fukui pref.) to establish FUYUHIRO lineage in Kansho era (1460-). FUYUHIRO lineage enjoyed the confidence from generals and worked in Hōki or Bizen, Bingo or Izumo as well to meet with increasing demand. This katana is rather on longer side also very deep in curvature standing firmly on base to create classical grace of Tachi. Rustic Itame-hada with YUBASHIRI on Hiraji and a rather on stronger side quenching hamon both shows close resemblance of Soushu-technique holding stirring Samurai spirits in full. 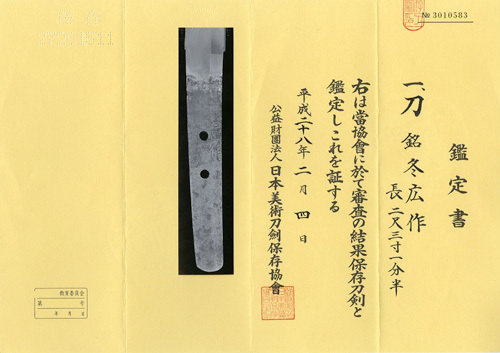 During battle age in Muromachi the medieval period, FUYUHIRO who belonged to Sōshu school had come into constant relationship with raised lineages of Bizen or Mino school like this example and met with increasing demand. FUYUHIRO family tree had been prospered to NAGANOBU 長信 of the 17th generation FUYUHIORO until end of Edo period.